Home Bookseller Bridget Strevens-Marzo Carnegie Medal Illustrating Illustration Illustrators Kate Greenaway Medal pictures means business Sarah McIntyre Pictures Mean Business: Historic Moment! Brilliant author-illustrator, maker and shaker Sarah McIntyre deserves a big round of applause from Scoobie illustrators and all author-illustrators for alerting the Bookseller to the anomaly that illustrators were not listed alongside writers as co-authors of children’s books. See below for what a hashtag #picturesmeansbusiness can achieve in a short time. Sarah has kindly allowed Words & Pictures to include an extract from her blog about this. But there is more to do. Click here to find out what! you can spot Tony Ross, Garry Parsons and Axel Scheffler, who wouldn't have been listed as of last week. If you take a look at their covers, you can immediately see these books aren't just words and paper; so much of what makes them is the illustrations. Huge thanks to everyone who's been supporting the #PicturesMeanBusiness campaign! Even when we've pointed things out, people have been incredibly helpful and made changes; there's no lack of goodwill, it's just sometimes people haven't noticed illustrators being left out. So what's happened so far? What have we definitely achieved? 1. Carnegie listing: illustrators were included on the Carnegie medal longlist. Writers were always listed on the Greenaway lists, even though it's an illustration award, and the listings had followed a long-standing format, using incomplete data supplied by Nielsen. (Philip Reeve has always freely credited me as a co-author for Oliver and the Seawigs so our own listing there was obviously incorrect. He's blogged about it here.) The committee still need to consider how illustrations play a part in judging these books, and if they can accept co-authored books in future lists. 2. An online and printed apology from The Bookseller for feature article celebrating writer Michael Rosen as the creator of the We're Going on a Bear Hunt picture book with no mention of illustrator Helen Oxenbury. This kind of omission has been common in the media generally and hopefully we'll be seeing less of it. But The Bookseller is a trade magazine, and we really need our own book people to be pioneers in this - bloggers, publishers, parents, teachers, people who already love illustrated books. 3. The Book People amended the listings of winners on the website for the Red House Children's Book Awards to include illustrator Oliver Jeffers in the award for The Day the Crayons Quit. Only writer Drew Daywalt had been credited, although apparently Jeffers was also credited in the printed press release. The website manager still hasn't fixed the listings for the other nominees. The Book People's Twitter spokesperson explained that they gathered their own data, but the website didn't allow enough characters on the line to include two names (so at least one co-author was also left out). The spokesperson said it might take a while to fix this but they'd get on the case. 4. The Reading Agency amended their Summer Reading Challenge Record Breakers book collections online lists to include illustrators. They had included some illustrators but not all, and they explained that their data came from the publishers. Kudos to them, they were very quick to fix this, and thanks to writer Caryl Hart for leading the way on this one. 5. 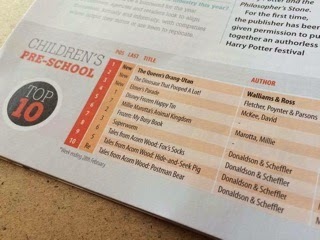 The Bookseller magazine has begun listing illustrators in sales charts. Sarah - I had no idea that illustrators were omitted in this way. You have fought the good fight, and I applaud you mightily. Fantastic.